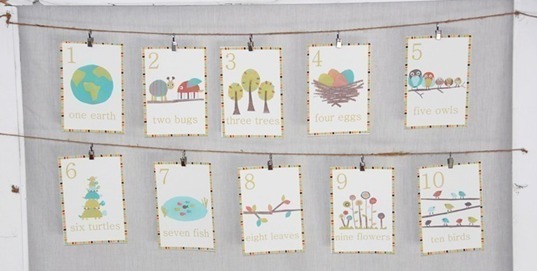 Learning to count is as easy as 1, 2, 3 when your baby can gaze at sweet and colorful numbered nursery prints. Print Pattern Paper boasts an adorable, gender neutral colored set of wall cards featuring original designs first created in scrap paper by artist Rebecca Peragine. Illustrations of bugs, owls, leaves, flowers, birds, turtles and more creatures found in nature alongside numbers 1-10, will help children learn their numbers in no time. Wall cards come in sets that measure 5×7 or 8×10 and are beautifully created with 100% recycled cardstock and printed with soy ink. The perfect affordable and educational way to brighten up the nursery or playroom wall! Learning to count is as easy as 1, 2, 3 when your baby can gaze at sweet and colorful numbered nursery prints. Print Pattern Paper boasts an adorable, gender neutral colored set of wall cards featuring original designs first created in scrap paper by artist Rebecca Peragine. Illustrations of bugs, owls, leaves, flowers, birds, turtles and more creatures found in nature alongside numbers 1-10, will help children learn their numbers in no time. Wall cards come in sets that measure 5x7 or 8x10 and are beautifully created with 100% recycled cardstock and printed with soy ink. The perfect affordable and educational way to brighten up the nursery or playroom wall!